To begin you will need to get a “benchmark” reading on a panel that most likely has not been repainted. The inside of a door or door jamb is ideal. Place the magnetic tip at a 90 degree angle on the surface to be measured. Pull the tool away from the surface until it releases its hold. Get a reading from the extended section of the barrel. Take multiple readings on the door jamb and choose the most consistent number to get an accurate benchmark. Once that number has been established, go around the car and compare other areas to the benchmark measurement. 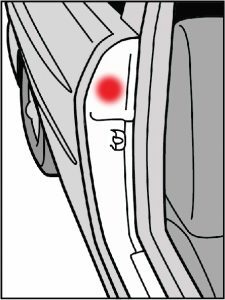 The diagram below shows you the areas to check first. The technique for measuring should always be consistent. Any angle other than 90 degrees will result in false readings. The speed at which you pull away from the surface will also need to be consistent. Do not pull very slowly on one area and fast on others as this will affect the measurement. The Paint Spy is a magnetic based tool. 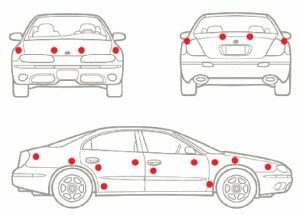 Be aware that most cars have plastic bumper covers and trim pieces and other cars will have fiberglass hoods.The Paint Spy will not work in these areas. 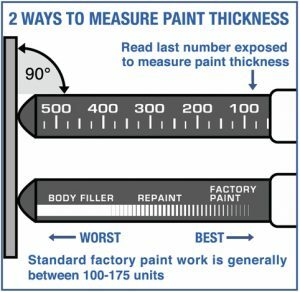 Most factory paint will measure between 100-175 units, however some minor variation is normal for factory paint. If you find a measurement that is higher than the benchmark (for instance 200-300 instead of 100-175) then it is likely that the area has been repainted. Body filler, on the other hand, will usually generate readings above 300.